By age 50, the average American has lost 12 teeth (National Institute of Health statistic). People live with gaps, bridges, dentures, sunken faces, and an inability to chew food properly or to eat many of the foods they like. They canâ€™t even smile without being ashamed. These problems compromise their quality of life on a daily basis. What does immediate loading / immediate function mean? Removable partial denture can cause damage to existing teeth and gums. The TeethToday® Center is among a few Dental Implant Centers offering Immediate Load / Immediate Function procedures for replacing missing teeth. With this time and cost savings procedure, a high resolution 3D CAT scan is used with virtual planning software to plan and facilitate the design and fabrication of both the temporary and final replacement teeth. To save on treatment time, this procedure is completed after the initial consultation with the patient and before the scheduled implant placement itself. TeethToday® is the name of this innovative dental procedure during which a patient is given new teeth supported by dental implants, with the entire procedure being completed in 1 or 2 office visits within a 24 hour time period. The procedure uses what is called the immediate load technique where the new provisional tooth and the implant post are placed during the same procedure or within one day. Patients will never leave our office without teeth. Why consider immediate loading or TeethToday® dental implants? Removable dentures or other dental appliances are frequently uncomfortable, even painful, ill fitting and sometimes will just sit on a shelf at home. Removable appliances can cause bone loss (atrophy) and gum recession. These dental appliances are often difficult to keep clean which can result in a bacteria infested environment that can lead to infections, bad breath, more root canals and weaker teeth that may fracture and lead to subsequent tooth loss. Dental appliances often have an unnatural appearance too, which is why they are known as "false teeth." Most people take dining in restaurants or kissing someone you love for granted. Individuals with dental appliances, such as removable dentures, know that intimate situations or social dining can be a frequent cause of embarrassment. In addition, these appliances may even make it difficult to speak clearly enough for you to be understood by your family, friends and business associates. 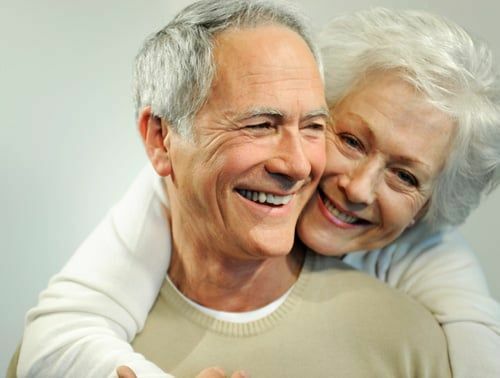 For denture wearers all these normal, everyday experiences are rarely discussed -- it is almost taboo or too awkward to approach these subjects with your family or friends. You just learn to live with the shame, indignity and humiliation of a mouth that has betrayed you. If this sounds like your life then now is your opportunity to take control of your mouth with the help of TeethToday®. Whether you have failing teeth, bad teeth, removable appliances, fixed bridges, old dental implants, or you need to replace a single-tooth, multiple teeth or even a full mouth of teeth TeethToday® will make you feel like a whole person again. Your smile will make you look like the person you remember seeing in the mirror or the person you always wanted to see. Believe it or not, TeethToday® makes it possible for you to walk into our office with missing teeth and leave with a completely new set of beautiful teeth. In one day. Believe It! Can I really walk out of the office with NEW teeth and actually go out and eat with them right away? Yes. In both clinical research and in our dental practice we have successfully used our TeethToday® procedure to provide patients aged 16 to 100+ with new teeth. The doctors at the TeethToday® Dental Implant Center are some of the world leaders in using this revolutionary technology! Our patients have shared with us their success stories of what walking out of our offices with permanent teeth has meant to them. Being able to eat their favorite foods again. You can carefully eat immediately and you can take a bite out of that delicious apple in a few weeks. Click Here to link to our Smile Gallery to find some of our patients success stories. TeethToday® smile tomorrow.